Our world-class caterers and dining facilities are ready to make every special dining event – whether a breakfast, luncheon, brunch, dinner or reception – unique, delicious and memorable! Nothing helps you set the mood and distinguish the occasion like an accomplished catering partner. Supported by our state-of-the-art kitchens, the artistry of our experienced culinary maestros, and the services of a crisp-and-polished wait staff, we’ve got you covered. Plan your special event supremely confident that we will be an extension of your creativity and good taste. 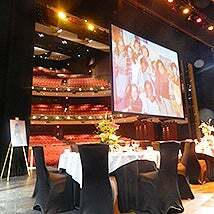 The Kessel D. Stelling Ballroom at Cobb Energy Performing Arts Centre is one of Atlanta’s most elegant and popular event venues. This beautiful ballroom is unsurpassed as a classic backdrop for banquets of any kind: breakfast meetings, brunches, luncheons, dinners, receptions and more. Plan on the perfect breakfast, lunch, brunch, dinner or banquet! You can count on Cobb Energy Performing Arts Centre to provide world-class facilities and a friendly, professional staff offering relentless attention to detail and a make-it-happen mindset.